Topics & Questions for Discussion 1. Though The Glass Castle is brimming with unforgettable stories, which scenes were the most memorable for you? Which were the most shocking, the most inspiring, the funniest? 2. 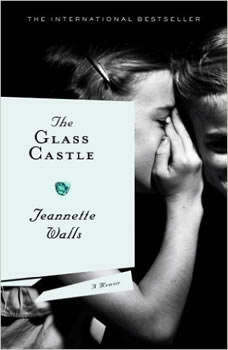 Discuss the metaphor of a glass castle and what it signifies to Jeannette and her father. Why is it important that, just before leaving for New York, Jeannette tells her father that she doesn't believe he'll ever build it? (p. 238). 3. The first story Walls tells of her childhood is that of her burning herself severely at age three, and her father dramatically takes her from the hospital: "You're safe now" (p. 14). Why do you think she opens with that story, and how does it set the stage for the rest of the memoir? 4. Rex Walls often asked his children, "Have I ever let you down?" Why was this question (and the required "No, Dad" response) so important for him -- and for his kids? On what occasions did he actually come through for them? 5. Jeannette's mother insists that, no matter what, "life with your father was never boring" (p. 288). What kind of man was Rex Walls? What were his strengths and weaknesses, his flaws and contradictions? 6. Discuss Rose Mary Walls. What did you think about her description of herself as an "excitement addict"? (p. 93). 7. Though it portrays an incredibly hardscrabble life, The Glass Castle is never sad or depressing. Discuss the tone of the book, and how do you think that Walls achieved that effect? 8 Describe Jeannette's relationship to her siblings and discuss the role they played in one another's lives. 9. In college, Jeannette is singled out by a professor for not understanding the plight of homeless people; instead of defending herself, she keeps quiet. Why do you think she does this? 10. The two major pieces of the memoir -- one half set in the desert and one half in West Virginia -- feel distinct. What effect did such a big move have on the family -- and on your reading of the story? How would you describe the shift in the book's tone? 11. Were you surprised to learn that, as adults, Jeannette and her siblings remained close to their parents? Why do you think this is? 12. What character traits -- both good and bad -- do you think that Jeannette inherited from her parents? And how do you think those traits shaped Jeannette's life? 13. For many reviewers and readers, the most extraordinary thing about The Glass Castle is that, despite everything, Jeannette Walls refuses to condemn her parents. Were you able to be equally nonjudgmental? 14. Like Mary Karr's Liars' Club and Rick Bragg's All Over But the Shoutin', Jeannette Walls' The Glass Castle tells the story of a wildly original (and wildly dysfunctional) family with humor and compassion. Were their other comparable memoirs that came to mind? What distinguishes this book? Companion to the PBS series. An unforgettable story of the joy of motherhood, the bravery of a community, and the hope of one extraordinary woman. it's hard to believe this is a memoir, because i cant imagine parents so irresponsible. especially given what we learn at the end. i admire jeanette and her siblings so much for getting through that and still making such great human beings out of themselves. if we all put that much effort into living, we'd be really super people. this is an interesting memoir. the author writes well and clearly. The stories she tells are interesting. I couldn't put this one down. 300 pages went by so quickly. I read a lot and this one really made an impression on me. How a family can survive the way this one did is unbelieveable. The real shock is how this woman could actually have any sort of relationship with her parents once she is an adult. GREAT READ FROM BEING TO END!!! I WOULD EVEN GO SO FAR AS TO SAY OUT OF THE MAYBE FIVE MEMOIRS I'VE READ THIS WAS BY FAR THE BEST!! !